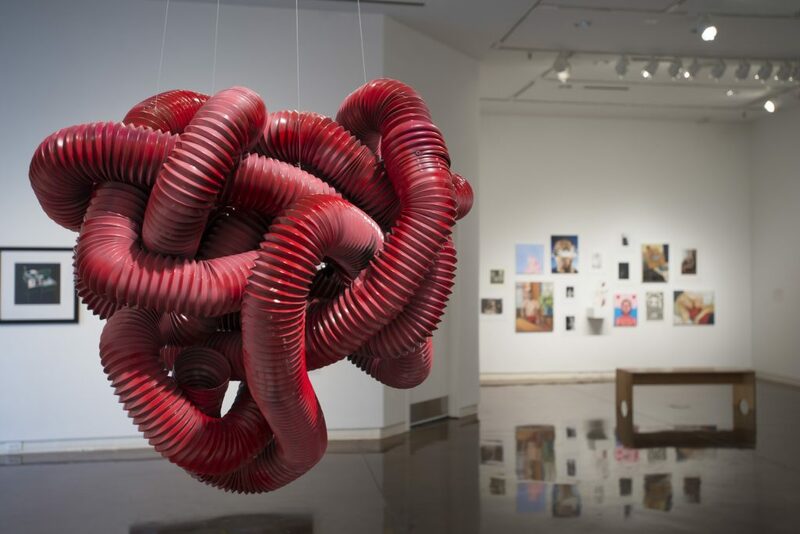 In what has become a venerable tradition at the College of Charleston, the Halsey Institute of Contemporary Art presents Young Contemporaries 2019. Now in its 34th year, the exhibition features work by College of Charleston students selected by a nationally prominent juror. The exhibition reflects the strength and diversity of practice in the School of the Arts’ rigorous programs. Featuring a wide range of media—including paintings, sculpture, photography, and prints—the exhibition showcases the talent of the student body at the College. The juror for Young Contemporaries 2019 is Dan Estabrook. Concurrent with Young Contemporaries will be the Salon des Refusés exhibition, showing in the exhibition space of the Simons Center for the Arts. The works in the Salon were chosen by Studio Art faculty. The origin of the Salon des Refusés dates to Paris in 1863, when artists who had been rejected from the official Salon caused such a protest that Emperor Napoleon III ordered another exhibition held for them. Among the painters in the original Salon des Refusés were Camille Pissaro, Henri Fantin-Latour, James M. Whistler, and Edouard Manet. CofC Fall 2018/Spring 2019 Students including December 2018 graduates. Original artwork completed between April 2018 – March 2019. Students may submit up to three pieces per artist, per medium (prints, sculptures, etc.). Bring eligible work to the Halsey Institute on Monday, March 11, 10am-7pm. You must bring your own work yourself. Contact Bryan Granger, Director of Exhibitions and Public Programs, at grangerbw@cofc.edu. Dan Estabrook was born and raised in Boston, where he studied art at city schools and the Museum of Fine Arts. He discovered photography in his teens through the underground magazines of the punk-rock and skateboarding cultures of the 1980’s. As an undergraduate at Harvard he began studying alternative photographic processes with Christopher James. In 1993, after receiving an MFA from the University of Illinois, Urbana-Champaign, Dan continued working and teaching in Illinois, Boston, and Florida, eventually settling in Brooklyn, New York. Dan has continued to make contemporary art using the photographic techniques and processes of the nineteenth century, with forays into sculpture, painting, drawing and other works on paper. He has exhibited widely and has received several awards, including an Artist’s Fellowship from the National Endowment of the Arts in 1994. A documentary on Dan and his work was produced in 2009 for Anthropy Arts’ Photographers Series. He is represented by the Catherine Edelman Gallery in Chicago.